Hey all. Jon here. Just a quick update. Greasetrap isn't dead, he just hasn't gone anywhere interesting lately. He's also being very, very lazy. Just laying on the floor, moaning about how hungry he is, and trying to get people to pour dry Cheerios into his mouth from the box. I'll prod him into trying something new soon. Have you ever been disappointed by disappointment? I WANTED to like this place. I still kind of do, actually. It's just . . . I was a little let down by the sandwich. Maybe I'm just being picky, after the heavenly perfection of the last entry. Le Chon is down off the Portland waterfront in the downtown area. The venue is nice! Very much a modern bistro. And they didn't blink twice at a dragon walking in out of the rain. For an appetizer I had gaucho bread, with bonfire salt and a chimichurri dipping sauce. It was good! The bread was toasted on the outside, but soft and buttery on the inside. It paired perfectly with the chimichurry for a spicy, limey mouthful tinged with cilantro. Yum. The sandwich . . . *sigh*. Argentinean steak with provolone, peppers, oninos, chimichurri all on a ciabatta roll. Served with a side of french fries seasoned with salt, pepper, and either a chili or paprika seasoning. Everything was good! Don't get me wrong. And the individual pieces of the sandwich were pretty great. The steak was juicy while still retaining a lot of its original flavor. The peppers and onions were distinct and fire-roasted. The chimichurry was, again, pretty awesome. But they all failed to come together as a whole. It was just a mouthful of stuff. Again, pretty good! But oh, what could have been. Three and a half fangs out of five. And a regret for a future that never was. I'm Greasetrap. I'm, uh, a dragon. Bigger than a dog, but smaller than a horse. Not that I'm like either of those things. I'd probably taste better than a horse. I mean, I'd have to, right? Nasty, terrible things. Where was I? Food. Right. I was on my way to the food cart pods in downtown PDX when something caught my eye. There are a LOT of restaurants in a city, so this isn't entirely unexpected. Going inside, I saw something tasty and just had to have it. 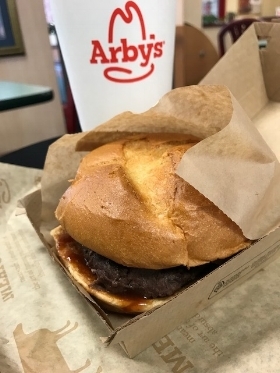 The Arby's Venison Sandwich was pretty much exactly that: a cut of venison steak on a bun. I guess the meat was cooked somehow special? Crispy onion things topped it, and it was slathered with a juniper berry steak sauce. The meat was peppery and tangy, probably the spices and sauce. There was a bit of gamey-ness to it, but it wasn't bad. The bun wasn't greasy like when some places brush it with oil or butter. It wasn't over-thick, either. Those little onion straws added a nice crunch to the texture, and a bit of carnival-onion-ring taste to everything. The root beer that came with the meal was root beer. Nothing worth writing home to the nest about. Overall? As Father would say, it earns a rating of "acceptable." I'd eat this again. Three out of five fangs. I guess it was a short-term deal, or something? So I can't go back and have it whenever I want. I want this sandwich even more, now. [Jon Burgess]: I'm a terrible blogger. No, really. The post before this one was about Worldcon back in 2015. Before that? I changed this website to a static page instead of a wordpress blog, because I wasn't ever updating the thing. [Jon Burgess]: Well. I'm hoping to try and change that. So! There'll be some new content here soon. Hopefully. I live in PDX, near a lot of great eating. Which is a perfect opportunity. I'll be starting up a food review series at this blog, probably called "Greasetrap's Gastronomy." [Greasetrap]: That is a terrible name. [Jon Burgess]: It's not bad. Should I have called it "Greasetrap Eats?" [Greasetrap]: That doesn't work either. They're not all good! 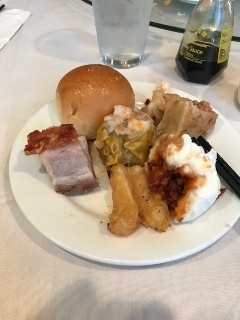 [Jon Burgess]: But you still devour it all anyway, don't you? [Jon Burgess]: That's what I thought. Now be quiet. As I was saying, I'll be starting up a food blog by Greasetrap here, one of the charachters of my current in-progress work (which you can start reading for free by signing up to my newsletter). At any rate, the first post should be up sometime in the next two weeks. Communities are fascinating. Wherever people exist you'll find them gathered together, grouped by cooperation, mutual interests, or simple survival. These days, you can have communities without the people involved even needing to be present. The internet is a tool that lets people from all over the world interact through forums, email, and social media. And like anywhere else, really, these interactions will sometimes be unpleasant. It's all over and done with now, but for the last year or so there's been a lot of online drama about science fiction and fantasy. Specifically, about an annual award convention award called the Hugo. I won't go into the full details of it all, but Wired has what I feel is a pretty decent summary up here, and even better, author Eric Flint has been keeping notes of the whole affair here. The basic jist, is that two online groups (calling themselves the Sad Puppies and the Rabid Puppies) felt that Worldcon's Hugo awards were only being awarded to people of a more liberal attitude by a conspiracy that didn't actually exist. That Worldcon had evolved into an elitist event running on cronyism and exclusivity. So, I attended this year's convention. Just under a month ago. Partially because the con was being held in my own backyard, and partially because of the chance for delicious schadenfreude. And when I arrived in Spokane, Washington this last august, I noticed something interesting. One; everything seemed to be on fire. Literally. Two; that the elitist Worldcon that everyone was worried about didn't seem to exist. I had many pleasant interactions out of the blue with con-goers both new and old. Worldcon is a community. Without a permanent home or even permanent members, it still attracts a group of people solely united by a shared love of science fiction and fantasy and all manner of geekery. They get together once a year, drink and attend panels, celebrate what they believe are the most important efforts over the last year, and then disperse. At the end of the day, it struck me that the Sad Puppes had spent so much time looking for a community which didn't even exist, that they missed the one right in front of them, one that anyone can join, and that's been going strong since 1939. ...a new blog, and a new chapter in my writerly life. I'll get around to importing the previous blog's contents...someday. Let's face it, I'm a terrible blogger. In any event, if you're new to my work, hello! And if you're an old friend, thanks for following me here, and keeping tabs on what I'm up to. 2014 was a quiet year, compared to the hustle and bustle of 2013. Still, I accomplished quite a bit, and there's more to come. This next weekend I'll be at Storycon here in the Portland Metro area (see storyconvention.com for info). Come down and say hello. I'll be running the "On the Shoulders of Giants" panel, which is all about helping readers to find something good to devour, and not just my own fiction. Before I log off, please consider signing up for the newsletter above. It's how I'll be communicating largely going forth, concerning new projects, new fiction, or what I'm up to. Don't worry-I promise to keep it relatively infrequent.